George Lucas Tops Hollywood Richest Filmmaker List. Spielberg Comes In Third. George Lucas is the richest filmmaker in Hollywood according to an article at CNN Money. They quote data from a Wealth-X list and George Lucas comes in at number one. Another of the Bearded Trio comes in third, Steven Spielberg. James Cameron rounds up the top ten. Check out the list below. 1 George Lucas $5.4 billion "Star Wars"
2 Arnon Milchan $5.2 billion "Pretty Woman," "12 Years a Slave"
3 Steven Spielberg $3.3 billion "E.T.," "Jaws"
4 Austin Hearst $1.9 billion "The Vow"
5 Ryan Kavanaugh $1 billion "Little Fockers"
6 Jeffrey Katzenberg $910 million "Shrek"
7 Thomas Tull $870 million "300," "The Hangover"
8 Jerry Bruckheimer $850 million "Pirates of the Caribbean," "Top Gun"
9 Steve Tisch $720 million "Forrest Gump"
10 James Cameron $670 million "Titanic," "Avatar"
I really thought Peter Jackson will be included on the list after he was recognize as one of the Richest Film Directors of Hollywood. 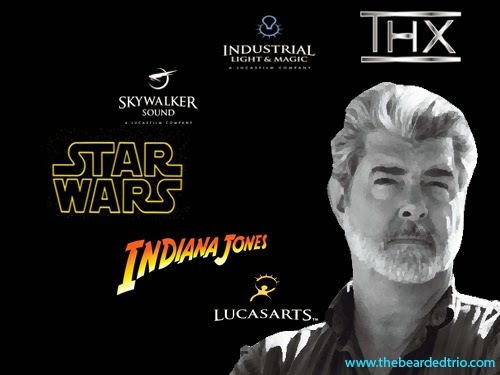 Though I'm not surprise anymore with George Lucas to be on the top. He's really brilliant, no doubt. Anyway, do you have list for Hollywood Richest Actor? I really love to know who top this year! Thanks.